You can Ritual Summon this card with “Machine Angel Ritual”. If this card is Ritual Summoned: You can make your opponent send 1 Spell/Trap they control to the GY. When this attacking card destroys an opponent’s monster by battle and sends it to the GY: You can activate this effect; this card can make a second attack on an opponent’s monster in a row. Once per turn, when your opponent activates a card or effect that targets a “Cyber Angel” Ritual Monster you control (Quick Effect): You can shuffle 1 Ritual Monster from your GY into the Deck, and if you do, destroy 1 card your opponent controls. This is a perfect end to Cyber Angel week, in a new Monster, Cyber Angel Izana. So, Light, Fairy, Ritual (obviously), Level 8, with 2500 attack and 2600 defense respectively. Machine Angel Ritual is still in play in the text of the card, but you’re familiar enough with that by now (we did touch on Machine Angel Absolute Ritual as well earlier) to keep options open. If Ritual Summon, Izana grants you the option to have your opponent send one of their Magic or Trap cards to the Graveyard. This is a welcome, and good ability here, a free +1 in your favor. We have a watered down BLS effect also, where if she destroys a Monster, she can make a second attack (in a row) on another Monster your opponent controls. Not quite as strong, and with less attack, but I appreciate balance. Lastly, once a turn (as a Quick effect) when your opponent targets a Cyber Angel Ritual Monster you control with an effect (Monster or card) that Targets, you can shuffle a Ritual Monster from your Graveyard back to your Deck (and if successful) destroy a card your opponent controls. Recycling is good, negation is good, I wish it wasn’t limited to Targeting, but it’s still very good. Not great, but solidly good. Art: 5/5 The trident is an odd weapon for an angel, in my opinion, but the bright and darks compliment each other very well from her body, to the background and foreground. Ending Cyber Angel Week off with a card you probably saw coming, the new Ritual Monster for Cyber Angels, Cyber Angel Izana. Izana is a Level 8 LIGHT Fairy Ritual with 2500 ATK and 2600 DEF. Very respectable stats on a Level 8, being LIGHT and Fairy is great as well. 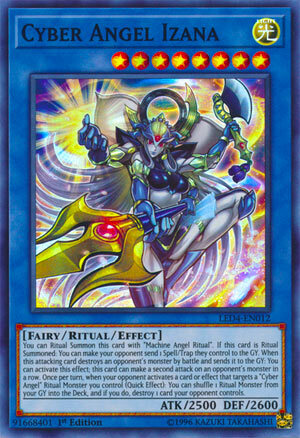 This card is similar to Benten and all the other Cyber Angels where Machine Angel Ritual is their Ritual card, but you got access to Machine Angel Absolute Ritual as well as Incarnated Machine Angel. Level 8 is easy and can use a combination of Cyber Angel Benten, Manju or Senju, the Impcantations, Cyber Angel Idaten, Cyber Angel Dakini, Cyber Petit Angel, and Cyber Egg Angel with Machine Angel Ritual or Machine Angel Absolute Ritual (the latter needs exact matching levels, but you can use your GY to put cards in the deck for said Ritual Summon). If this card is Ritual Summoned, you can make your opponent send 1 Spell/Trap they control to the GY. Dakini clears out monsters, so Izana covers where Dakini doesn’t with Spells and Traps, and your opponent having Spells and Traps on the field, while not as common as before, isn’t completely uncommon. It can force your opponent to use a Spell or Trap at an unoptimal time, especially if it is the only Spell or Trap they had. When this attacking card destroys a monster in battle and sends it to the GY, you can activate this effect to let Izana attack another monster once again in a row. I assume it is a once per turn since it says second attack, but this should easily be able to clear two monsters with 2500 ATK. Once per turn (Quick Effect), when your opponent activates a card or effect that targets a Cyber Angel Ritual Monster you control, you can destroy 1 card they control by shuffling a Ritual Monster from your GY into the deck. All the bigger Cyber Angel Rituals have effects to recycle Rituals, Dakini gets back your Ritual Monsters or Machine Angel Rituals from your GY to your hand at the end of each of your turns, Vrash negates destruction effects by shuffling a Ritual Monster from your GY to the deck, and now Izana does something when your monsters are targeted by shuffling a Ritual from your GY to the deck. My problem is that it doesn’t negate, so something is likely happening to the Ritual that is targeted unless you use Izana to destroy an Equip, Continuous (Spell or Trap), or Field Spell that targeted this or another Ritual, but at the same time this can potentially destroy a bigger threat your opponent has, and it being non-targeting is a big benefit in many cases. If it negated and destroyed something else your opponent controlled, that’d be amazing, but otherwise this card is pretty solid. It is a fine one of since you got tons of ways to search for it in the Cyber Angel strategy with Benten, Manju and Senju, Cyber Petit Angel, and Ritual Sanctuary. Izana is worth having though, cause I can imagine she will be useful in some cases. Art: 4.5/5 I said it with Merciful Machine Angel, but I’m shocked she wasn’t censored that much. She is very pretty, though, and I can’t imagine censors ruining that any.